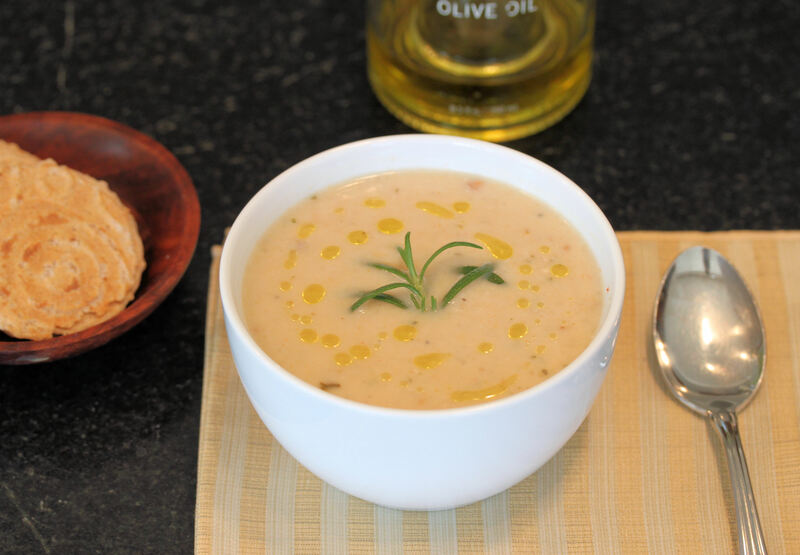 White bean soup is a great and simple meal for cooler days. It is also a perfect make ahead soup as the flavors only get better as it sits. This particular recipe is a lighter version because there is a small amount of cream added at the end and the base of the soup is chicken stock. 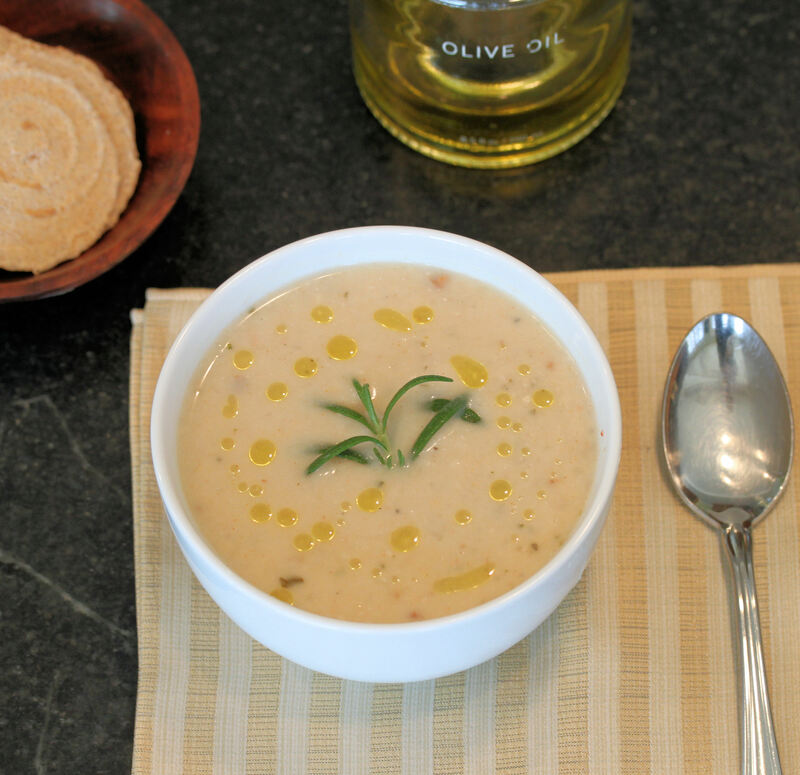 There is a subtle flavor of rosemary that permeates thru the soup which gives it a nice savory flavor. Canned beans can be substituted. However, they tend to be softer and saltier. Be sure to was rinse the beans. Use 3-4 15 ounce cans, depending on desired thickness of soup. Below are a few ideas that will give the soup more of a kick. • Reduce the stock to 3 cups and add 1 cup of dry white wine. • Cooked ground chorizo with some of it’s oil is a great touch. Stir it in before serving. This time, I went with the chorizo along with the garlic oil. This combo was perfect. Prepare the beans per package instructions. Add ½ an onion, 3 whole cloves garlic, 2 sprigs of rosemary, bay leaf, 1 teaspoon kosher salt, and ½ teaspoon black pepper while cooking the beans to enhance flavor. The beans can be made ahead of time and refrigerated until used. Heat the olive oil in a large 4 quart saucepan over medium high heat. Add the chopped onions and cook until translucent, 3-5 minutes. Add the garlic, red pepper flakes, chopped rosemary, and remaining sprig rosemary. Cook for another minute then add the beans and chicken stock and bring to a boil. Reduce to a simmer for 20-25 minutes to allow the flavors to meld. Remove the beans from the heat and take out the rosemary sprigs and bay leaf. Use a hand-held immersion blender and blend until creamy. A food processor fitted with a steel blade will work as well. Return the soup to the heat and warm if necessary. Stir in the crème until fully incorporated. Season with salt and pepper to taste, if necessary. Ladle into individual serving bowls. Drizzle with a touch of olive oil. Garnish with a small sprig of rosemary. Serve with fresh bread. 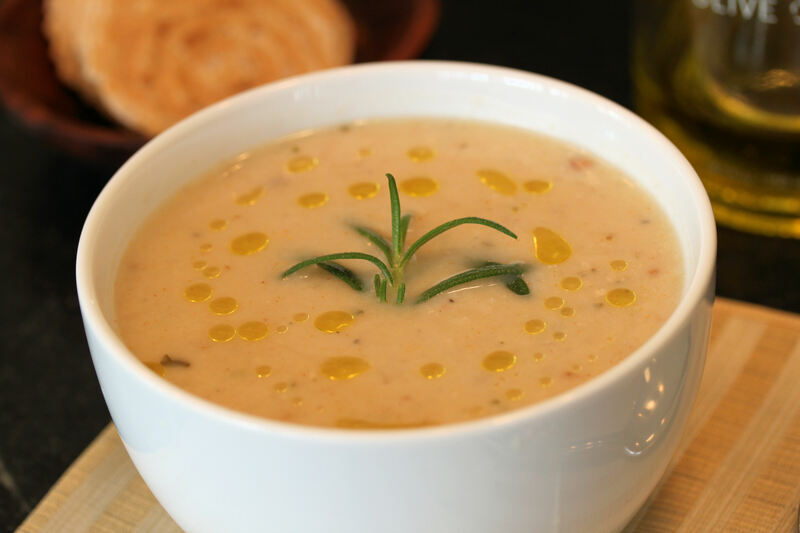 This entry was posted in comfort food, healthy options, italian, main course and dinner, side dishes, soups and stews and tagged creamy white bean soup, rosemary, rosemary and garlic white bean, soup and stew recipes, soups, white bean soup. Bookmark the permalink. White bean soup…it probably has quite a bit of fibre and protein too, ey? That would be so delicious!